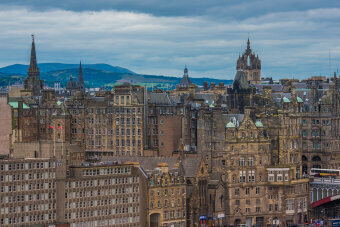 Edinburgh is undoubtedly one of the most beautiful cities in the world. The capital city of Scotland is a stunning example of urban planning done right through the centuries. UNESCO declared it a World Heritage Site because the 18th Century New Town is so striking against the medieval fortress dominating the Old Town. It’s also the perfect place to start our new tour of the Scottish Borders region, hands down the best cycling in the country. Lush farmland, heather-clad hills, abbey ruins and dramatic coastline cliffs make for wonderful scenery both on and off the bike! Rolling terrain with some longer climbs. Moderate cycling level. Leisurely level with an ebike. 7 nights lodging, 7 breakfasts, 5 dinners, snacks, rental hybrid or road bike, van support, and trained guides. Hybrid or road bike is included in the cost of the tour. Electric-assist bike is $195. Fly in and out of the Edinburgh airport. Then take the 30-minute Airlink 100 bus for about $6 to the city center and walk the ½ mile to our hotel. Or take a taxi. 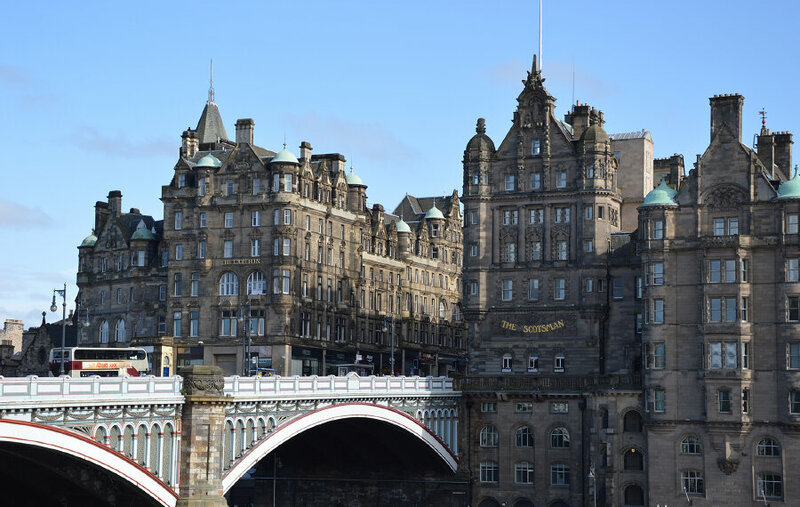 At the end of the tour, we will shuttle you to the Edinburgh airport, arriving by 9:30am. You can also fly round-trip to Glasgow. There are buses and trains that go between the two cities, take less than 2 hours and cost less than $30. "The guides were great and the participants were friendly and fun. The weather was surprisingly great. The hotels were nice and I know there weren't many choices in the rural areas of Scotland. A wonderful trip overall!" DAY 1: If time allows, come early (or stay late) to explore Edinburgh. 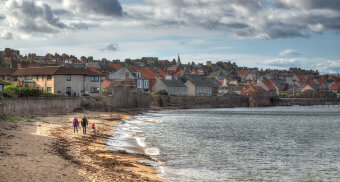 Built over centuries on seven hills in a narrow spit of land, the city begs to be discovered. 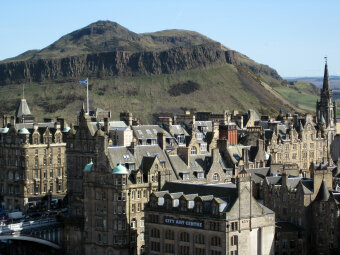 The Edinburgh Castle watches over the city from its perch on Castle Rock. Lined with charming historic landmarks, cafés and stores selling kilts, the Royal Mile connects the castle to the Palace of Holyroodhouse, one of the Queen’s official residences. 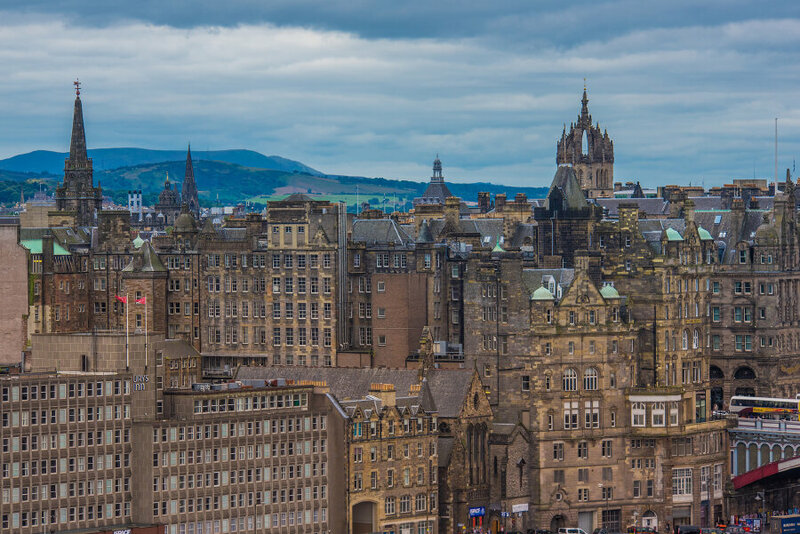 If that doesn’t keep you busy, visit the St. Giles Cathedral, the Royal Botanical Garden, and the National Museum. Then we will meet at 3:00pm for a rental bike fitting, orientation and dinner. 0 miles. DAY 2: We’ll begin our cycling by leaving Edinburgh this morning on a bike path and then continuing on part of the John Muir Way. This route stretches more than 150 miles and is named for the naturalist and founder of the Sierra Club. He was born in the seaside town of Dunbar, which is our destination for the night. 36 miles. DAY 3: Today’s ride takes us along the dramatic shoreline of the rugged Berwickshire coast with its towering red cliffs and rocky outcrops. 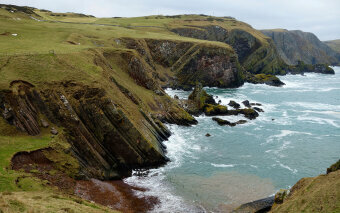 We’ll cycle through gorgeous St. Abb’s Head National Nature Reserve, famous for its year-round bird populations. 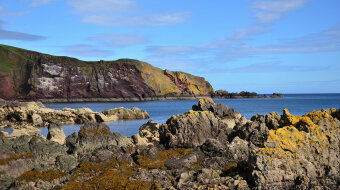 If you’re lucky, you may even see a Puffin nesting on the rock below. Then we’ll head inland to the charming town of Kelso. It sits at the confluence of Rivers Tweed and Teviot and is known for having the largest market square in all of Scotland. We’ll stay two nights on the cobblestone square in an eccentric historic landmark originally built in 1769 as a stagecoach inn. 41 miles. DAY 4: Today’s loop ride takes us east and south into gently rolling rural farmland. We’ll bike through the picturesque villages of Yetholm Town and Kirk Yetholm before stopping at the Teviot Water Gardens. If you choose to have lunch after exploring the lush gardens here, be sure to try the Cullen skink or the smoked kippers! Once back in Kelso, you can choose to visit the 18th Century Floor’s Castle, Scotland’s largest inhabited house and home to the Duke of Roxburghe. Take a tour and see how the palace has evolved over time, get a glimpse of how the noble family lives today, and admire the beautiful view over the River Tweed. If you want to go further back in time, you can also visit the ruins of the Kelso Abbey. Dating from 1128, it was once a large and rich monastery. Today, it remains one of the most spectacular examples of Romanesque architecture in Scotland. Take all the time you need, as dinner is on your own tonight. 26 or 31 miles. 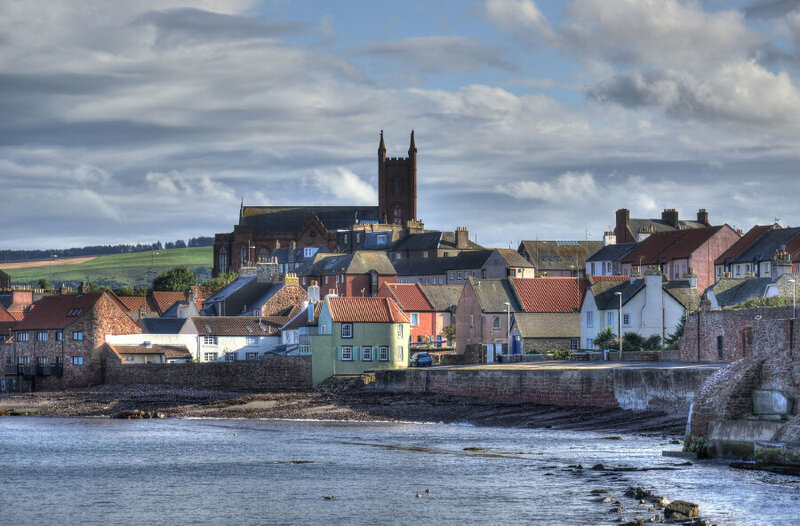 DAY 5: From Kelso we follow the River Tweed west to St. Boswells, a sleepy little village with an inviting bookstore and an award-winning butcher shop, the perfect place to try the quintessential Scotch pie, a double-crusted savory pastry filled with mutton or lamb. Love animals? St. Boswells is also home to the Scottish Borders Donkey Sanctuary, where rescued donkeys have an idyllic forever home, in the company of llamas, goats, sheep, and pigs. 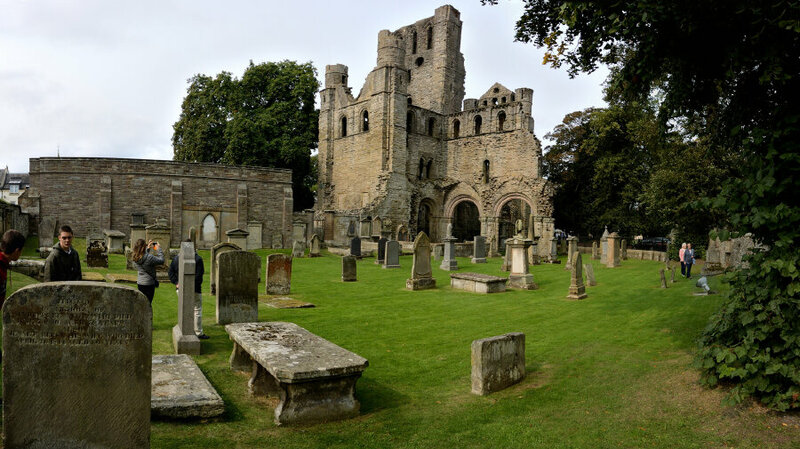 St. Boswells is also a good place to hop onto St. Cuthbert’s Way, a 62-mile walking trail through the Scottish Borders to Holy Island off the Northumberland Coast, St. Cuthbert’s eventual resting place. A shorter walk is to find the William Wallace Statue, a red sandstone monument honoring the famous 13th century Scottish knight portrayed by Mel Gibson in the 1995 movie Braveheart. The view here is spectacular. 30 miles. 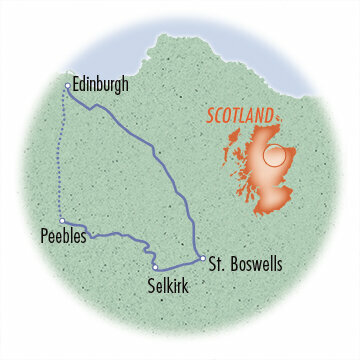 DAY 6: Our destination today is Selkirk, a town on the Ettrick Water (a tributary to the River Tweed) that is known for its breathtaking braes (steep banks) and charming wynds (narrow residential lanes). For lovers of traditional fashion and textiles, the visitor center is the place to learn about the historic production of tartan, tweeds and cashmere, and to shop for kilts, sporrans, serapes and Kerry jackets. 33 miles. DAY 7: Today, we’ll rejoin the River Tweed to a quaint town on its banks called Peebles. Along the way, we’ll get a stunning view of Yarrow Valley and stop at Traquair House, the oldest continuously inhabited house in Scotland dating from 1107. You can walk through the hedge maze or simply sample the beers from the onsite brewery. Our next stop will be Robert Smail’s Printing Works, a living museum of the last working Victorian letterpress printer. You can even try your hand at typesetting the old-fashioned way. We’ll end the ride the same way we began earlier in the week — on a beautiful paved bike path. We’ll celebrate our tour through The Borders and The Lothians regions of Scotland at our final dinner together tonight. 37 miles. DAY 8: We’ll enjoy our last Scottish breakfast this morning and then make the one-hour trip back to Edinburgh to say our goodbyes. We should arrive at the airport by 9:30am. 0 miles.